Submitted by Simon Coleman on Sat, 25 Jul 2015 - 15:35. 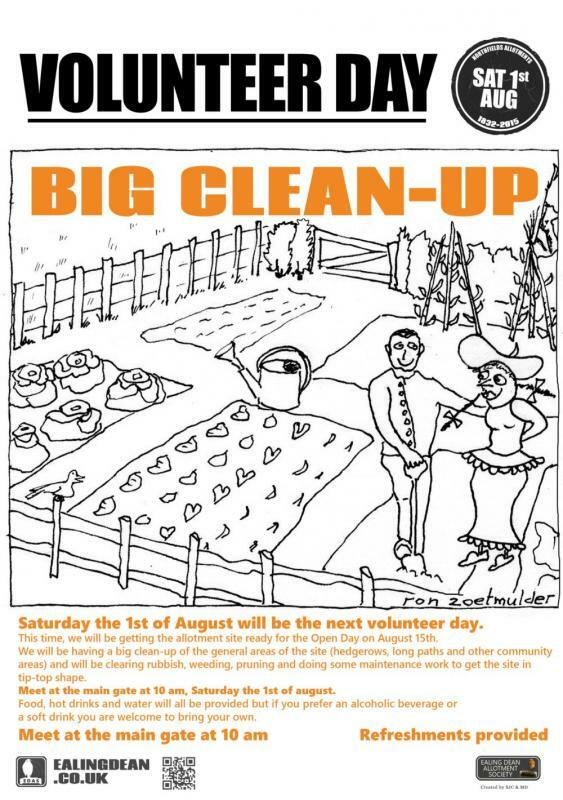 The next volunteer day is coming up on SATURDAY THE 1ST OF AUGUST. This time, we will clean up the allotment ready for the open day on the 15th Aug . This will include the tidying up the communal area, cutting back plants and overhanging branches in the main path, cutting the grass path and reconstructing the WW2 Anderson air raid shelter. MEET AT THE MAIN GATE AT ON NORTHFIELD AVENUE AT 10 AM, SATURDAY THE 4TH OF JULY. Come and join us, we will be treating you to a barbecue for all your hard work! Food, hot drinks and water will all be provided but if you prefer an alcoholic beverage or a soft drink you are welcome to bring your own.